Natural strawberry fruit leather is a big improvement over the packaged version! Make it in the oven or dehydrator. It’s strawberry-palooza time! 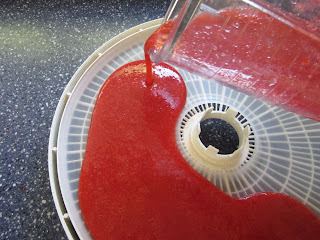 Thanks to a great price at the roadside fruit stand, this weekend I made strawberry jam, strawberry pancake syrup, and strawberry fruit roll-ups. This homemade strawberry fruit leather recipe is so easy, you won’t believe it. The idea and technique come from the fantastic book, Healthy Snacks to Go. Remember those delicious homemade granola bars? Yep, same book! Plop the strawberries in the blender and add the honey. Don’t add any water! 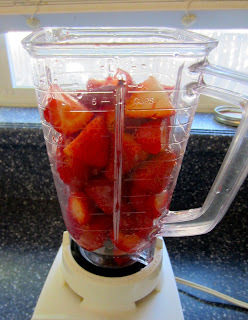 Just smoosh the berries down a bit so they’ll engage with the blades. 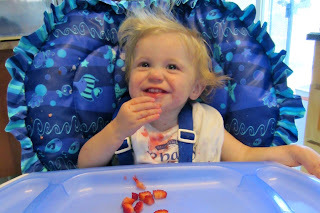 Give extra strawberries to your supervisor to flavor test while you’re working. Blend the berries until they become a smooth liquid. Now you’re ready to go! Either pour the liquid onto a Silpat and bake at 200 F for about 3 hours, or use a dehydrator. 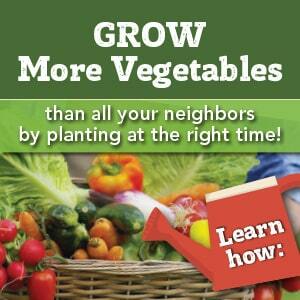 I tested out my sister-in-law’s Nesco American Harvest machine for this. Because it dries food at very low temperatures, it preserves the enzymes of the fruit and raw honey. Pour a layer about 1/4 inch thick on the fruit leather tray. 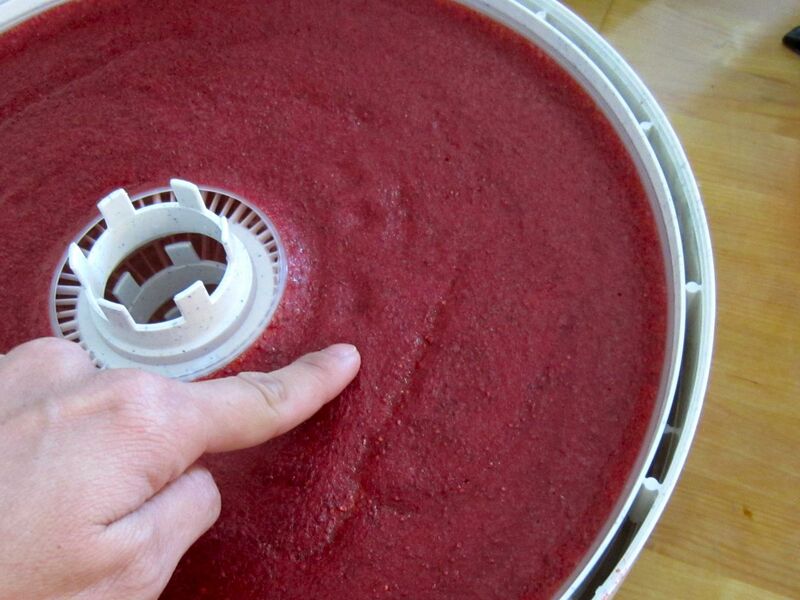 Set the dehydrator to 135 F and let ‘er rip. Since it’s cooking at such a low temp, it will take a while to be ready. I checked it after 3 hours. See the cracks near my finger? It’s drying, but isn’t ready yet. You can tell because touching it leaves pokey-finger-dents (that’s a technical term). After 6 hours, it was finally ready. 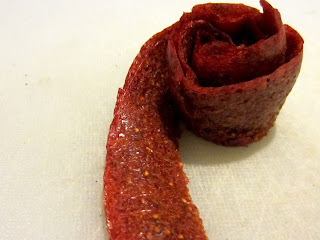 It peeled up in a nice, even sheet and sliced it into ribbons with a pizza cutter. They kind of look like strawberry roses! Oh, and let me show you something. This is right from General Mills’ website. Hey, Betty! Betty Crocker! You forgot the strawberries. 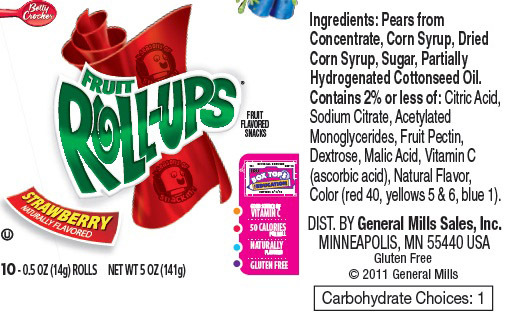 and of course, granola bars and fruit roll-ups. Give it a try—we’ve loved every recipe we’ve made from it! Now you’re ready to go! 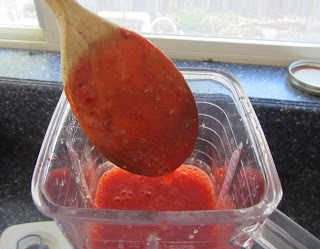 Either pour the liquid onto a Silpat and bake at 200 F for about 3 hours, or use a dehydrator. I used a dehydrator because it dries food at very low temperatures, it preserves the enzymes of the fruit and raw honey. Who’d have though this was so easy! I’m definitely going to need to make it. 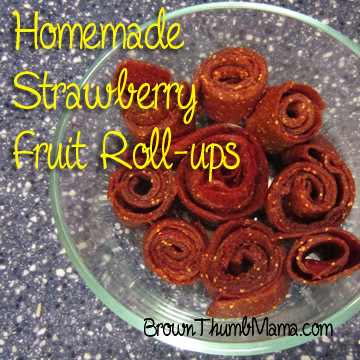 This is such a simple recipe, I have been wanting to make my own fruit leather this would be great! I always thought I needed a dehydrator! I would love for you to link this post up at Healthy 2day Wednesdays this week (up until Saturday afternoon) and other posts each week! I am new to your blog and really love it! Those look so good, and so easy. What a great idea to add a bit of honey. Thanks for sharing! Popping over from Raising Arrows link up. Yea! 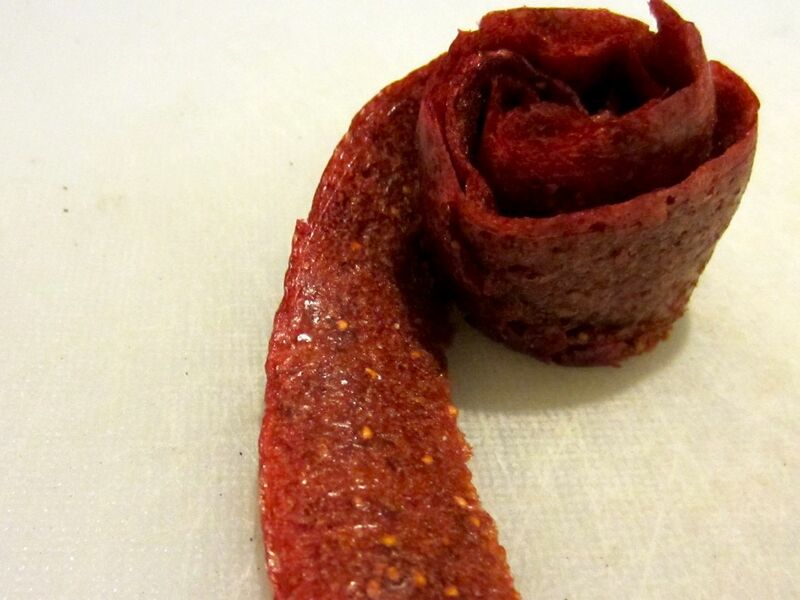 Glad you used the dehydrator. I think I need to sample them…. Yum. Ok, that settles it… I am getting a dehydrator! I have wanted one for over a year now! Love it! Thank you for sharing with us at Healthy 2Day Wednesdays! I so appreciate and am glad you are linking up your wonderful ideas! Keep ’em coming! Thank you for linking up at Thrifty Thursday! I love your recipe and it sounds absolutely delicious and so much healthier and more affordable than buying them from the store. Your post is featured this week at our link-up, hope to see you back again! I’m wondering how long of a shelf life these have?